It is no accident that President Obama’s America has given rise to Donald Trump. This week’s featured posts are “How Republicans Trumped Themselves” and “The Leadership We Need“. In “How Republicans Trumped Themselves” I pull together a chorus of voices that diagnose the Trump phenomenon as a symptom of a larger ill: The GOP has been pandering to bigotry for decades, and conservative media has created a safe zone for every kind of conspiracy theory, no matter how poorly grounded in reality it might be. Now that bigotry and that disregard of facts is being used against them. In “The Leadership We Need” I take a more abstract look at leadership, and describe how to tell a Leader from a Demagogue. Meanwhile, this guy knows how he wants to respond. In “How Republicans Trumped Themselves“, I briefly quoted Heather Hogan’s article “This is How Fox News Brainwashes Its Viewers“. 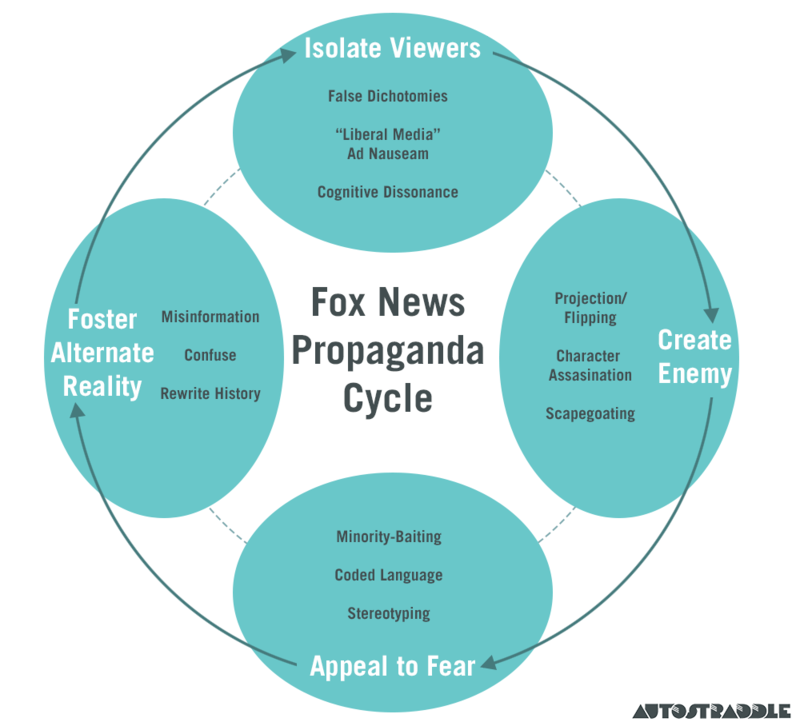 That article examines the complete Fox propaganda cycle and deserves to be read end-to-end. Grist does a good balancing of the good and bad. The COP21 conference brought every country to the table, they all accepted the science of climate change, and they agreed to work together to do something about it. But some proved more ambitious than others, and the rich countries didn’t come up with enough money to get the best deal possible. The bottom line is that the agreement gets us far closer to containing climate change than we were two weeks ago, but still far short of where we need to go. In fact, we won’t even know for years what it will accomplish. How much the agreement reduces greenhouse gas emissions, and through that reduces warming, will depend on whether countries meet their targets for curbing emissions and deploying renewable energy and whether they ramp up their ambition in the years ahead. Here’s what we now know about the San Bernardino shooting. 14 people were killed and 22 injured by a married couple, Syed Rizwan Farook and Tashfeen Malik, who were killed in a subsequent shootout with police. In the attack they used two semi-automatic rifles, two semi-automatic pistols, and an “explosive device”. The weapons were acquired legally by Farook and his friend and next-door neighbor, Enrique Marquez. They were illegally modified to accept larger magazines. Farook took out a $28K loan two weeks before the attack, which may have been used to buy guns, ammunition, and other supplies for the attack. Farook was born in the United States. He was a Sunni Muslim who traveled to Saudi Arabia more than once. In 2014 he met Malik there, and she came to the U.S. under a fiancé visa. While they appear to have had online contact with terrorist groups, so far there’s no indication that they actively belonged to a larger cell, or that anyone (with the possible exception of Marquez) helped them plan or finance their attack. Apparently, they were both already “radicalized” when they met. Farook attended a mosque, but stopped going there a few weeks before the attack, so it seems unlikely that somebody there whipped him up to do this. There is no evidence that anybody else at the mosque was involved. In short, San Bernardino does not seem to be an example of the kind of thing we’re being told to fear, and wouldn’t have been prevented by the anti-Muslim proposals we’re hearing: The attackers weren’t infiltrated into the U.S. by ISIS, they weren’t recruited at a mosque, and it’s not even clear that keeping Malik from entering the country would have prevented Farook from launching an attack. To me, Farook and Malik look a lot like Robert Lewis Dear, the Planned Parenthood shooter, or Dylann Roof, the Charleston church shooter. None of them seem to have been agents of a larger conspiracy, but they are all examples of what can happen when unstable people believe the kind of hateful, irresponsible rhetoric that is so easy to find these days, and then easily acquire deadly weapons. To me it barely matters which crazy set of beliefs your violence arises from, whether it’s that ISIS is the proper political heir to Muhammad, that the white race is facing a battle for its survival, or that Planned Parenthood is dismembering babies for profit. As responsible people, we should be trying to prevent all crazy ideologies from inspiring violence. Liberals understand that there are theological and political differences between the different kinds of radical fundamentalism that lead to terrorism, but we are keenly aware that people who pick up a gun in the name of God have more in common with each other than they do with the rest of us. The Daily Show‘s Jordan Klepper discovers that becoming an effective good guy with a gun is harder than it looks. Meanwhile, Canadian Prime Minister Justin Trudeau welcomed the first planeload of the 25,000 Syrian refugees he has promised to take in by the end of February. So Canada, a country with a fraction of our population, is taking in 2 1/2 times as many refugees. But I’m sure that when the Canadian experiment goes smoothly, and none of their refugees gets involved in terrorist attacks, American conservatives will see the err of their ways and happily increase the number of Syrians we’re giving refuge to. Won’t they? For some reason, this year I haven’t gotten around to writing all the book reviews I planned. So as a down payment on a longer post, I’ll leave you with two quotes from recent books about Islam. Both books portray Islam as more diverse and more flexible than is commonly imagined by the American media. A text’s repeatability in part depends on the potential for its old words to produce new results. A verse remains powerful not because it imposes its meaning on the future, but because it accommodates the future’s needs: The verse is not bound to its author or its first audience. Marking the 50th anniversary of A Charlie Brown Christmas, how the whole thing came to be, including a certain amount of the spiritual journey of Charles Schulz. An attempt to enlist the Peanuts characters in the War on Christmas yielded some pushback. I’m not the only one who’s been making the analogy between guns and security blankets. I’m not sure what mine would say, but I’m thinking about it. We’re not quite at the point of a government shutdown yet, but the agreement to prevent one is proving hard to work out. Jon Stewart came back to The Daily Show briefly to try to shame Congress into taking care of the 9-11 first responders. Russian production of T-shirts with anti-Turkish slogans has been delayed by disruptions in fabric imports from Turkey, Russian media reports said Wednesday. President Obama’s reluctance to plunge deeper into the Syrian mess looks a lot better when you compare him to less cautious leaders, like Putin. Knowing when not to act is as big a part of leadership as knowing what to do. In either case, the point isn’t to do away with animal products. But what if the number of situations where doing without them feels like a hardship got much smaller? That could make a huge difference in both public health and the environment. I think “err of their ways” should be “error of their ways”. Anyway, as a Canadian I’m glad we’re taking in 25000 refugees. But I don’t think it’s enough. We tend to measure ourselves against America, so when you guys do something badly we often congratulate ourselves for being less bad. Even if we’re not doing all that well ourselves. I think we need a kick in the pants. If America took in 100 000 refugees, that might make us do better. Watching QI months ago I heard that Galapagos tortoise was apparently the most delicious meat in the world – so delicious they’re now extinct. Then that thought brushed against the memory of the guy who made the first synthetic beef pattie, and I suddenly wondered: Why are we wasting time re-creating the meats we already have when there’s a chance to bring back the most eatable animal of all time? Surely one of the museums out there has a DNA sample? Beyond Meat, there’s your business opportunity right there. 1) This ain’t Jurassic Park. You’re going to need more than some tattered old DNA. We’re talking live, juicy embryonic stem cells, and lots of ’em. The unfortunate truth is that DNA at room temperature degrades on the scale of months to a few years, which is why I had to replace my control samples every few months back when I did PCR in the lab. On top of that, DNA is not everything you need to create an organism – you need the right intracellular environment as well, which is inherited from the mother’s egg cell, hence the need for a complete embryonic stem cell. I’m sorry, but your tortoises are not coming back. 2) As for other extant organisms, once they get the process safe, reliable, and cost-efficient for one species, it will be relatively easy to adapt it to others. 3) They have their work cut out for them just grappling with the science. Why also struggle with creating demand for a food so far out of the mainstream when there’s already a HUGE demand for beef?